Charges include transferring classified data onto his personal computer; transmitting national defense information to an unauthorized source; aiding the enemy. Bradley E. Manning (born December 17, 1987) is a United States Army soldier who was arrested in May 2010 in Iraq on suspicion of having passed restricted material to the website WikiLeaks. He was charged in July that year with transferring classified data onto his personal computer, and communicating national defense information to an unauthorized source. An additional 22 charges were preferred in March 2011, including "aiding the enemy," a capital offense, though prosecutors said they would not seek the death penalty. He was found fit to face court martial in April 2011, and currently awaits the first hearing. Manning had been assigned in October 2009 to a unit of the 10th Mountain Division, based near Baghdad. There he had access to the Secret Internet Protocol Router Network (SIPRNet), used by the United States government to transmit classified information. He was arrested after Adrian Lamo, a computer hacker, reported to the FBI that Manning had told him during online chats in May 2010 that he had downloaded material from SIPRNet and passed it to WikiLeaks. The leaked material is said to have included 250,000 U.S. diplomatic cables; footage of a July 2007 Baghdad airstrike; and footage of the May 2009 Granai airstrike in Afghanistan. Manning was held in maximum custody from July 2010 in the Marine Corps Brig, Quantico, Virginia, which in effect meant solitary confinement, conditions that Amnesty International called harsh and punitive. In April 2011, 295 scholars, including legal scholars and philosophers signed a letter saying the conditions he experienced amounted to a violation of the U.S. Constitution; later that month the Pentagon transferred him to a medium-security facility in Fort Leavenworth, Kansas, allowing him to interact with other pre-trial detainees. Manning and an older sister were born in Crescent, Oklahoma, to Susan Fox, born in 1953 in Wales, and her American husband, Brian Manning. His father had been in the United States Navy for five years; his parents met when his father was stationed in Wales at Cawdor Barracks. Manning was raised in Crescent, where his father worked as an IT manager for a rental car agency. He was small for his age—as an adult, he reached just 5 ft 2 in (1.57 m) and weighed 105 lb (47.6 kg)—good at the saxophone, science, and computer games, and even in elementary school had said he wanted to join the U.S. Army. One teacher told reporters that Manning was smart and opinionated, but was never in trouble. He was one of the few people in his community who openly rejected religion; David Leigh and Luke Harding write that he would refuse to do homework related to the Bible, and remained silent during the reference to God in the Pledge of Allegiance. They also write that his father was strict with him, which may have contributed to his becoming introverted and withdrawn, something that deepened when at age 13 he began to question his sexual orientation. 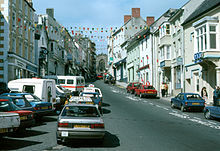 High Street in Haverfordwest, Wales, where Manning went to secondary school. One neighbor said his mother had difficulty adjusting to life in the U.S., and his father was often away, so Manning was largely left to fend for himself. His parents divorced when he was 13, and he moved with his mother to Haverfordwest, Wales, attending the local Tasker Milward school. He became known there for having an attitude, and for spending lunch time at the school's computer club, building his own website. Tom Dyer, who was at school with him, told reporters Manning would speak out if there was anything he disagreed with, which included having altercations with teachers. He said Manning was bullied because he was an American, the only one at the school; other students would impersonate his accent and mannerisms. He was also targeted for being effeminate; Denver Nicks writes that he had told his schoolfriends in Oklahoma that he was gay, but he was not open about it at school in Wales. He was miserable in Wales, and decided to return to the United States after sitting his GCSEs, moving in with his father, sister, and his father's second wife in Oklahoma City. He took a job with a software company, Zoto, and was apparently happy for a time, but was let go after four months, and became increasingly depressed. In March 2006, he reportedly threatened his father's wife with a butcher's knife during an argument. She called the police, and he was escorted from the house. He lived in the pick-up truck his father had given him, and took several low-paid jobs, before moving in with his father's sister, Debra Manning, in Washington, D.C. He enlisted in the army in October 2007, doing his basic training at Fort Leonard Wood, Missouri, and after graduating in April 2008 moved to Fort Huachuca, Arizona, where he trained as an intelligence analyst. Nicks writes that he was reprimanded while there for posting messages to friends on YouTube that apparently revealed sensitive information. In August 2008, he was sent to Fort Drum in Jefferson County, New York, where he waited to be sent to Iraq. It was while there in the fall of 2008 that he met Tyler Watkins, with whom he had his first serious relationship, posting happily on Facebook about it. Nicks writes that it appears to have ended by September 2009, though Leigh and Harding say it ended around May 5, 2010. Watkins was studying neuroscience and psychology at Brandeis University near Boston, and Manning would regularly travel there to visit him. It was at Brandeis that he was introduced to Watkins's network of friends, and the university's hacker community, as well as its ideas about the importance of information being free. He visited Boston University's "hackerspace" workshop, and met its founder, David House, the computer scientist and MIT researcher who has been allowed to visit him in jail twice a month. While at Fort Drum, Manning had already begun to lose control, according to Steve Fishman in New York magazine, falling out with roommates, and screaming at superior officers. He said he was being bullied for being gay, and by August 2009 had been referred to an Army mental-health counsellor. In October 2009, despite the doubts about his fitness to be deployed, he was sent to Iraq with the 2nd Brigade Combat Team, 10th Mountain Division, based at Forward Operating Base Hammer, near Baghdad. His unhappiness and loneliness continued there. Analysts were working 14–15 hours at a time in what he described as "a dimly lit room crowded to the point you cant move an inch without having to quietly say ‘excuse me sir,’ ‘pardon me sergeant major’ ... cables trip you up everywhere, papers stacked everywhere ..." He called it Groundhog Day. He was sent to a chaplain after officers noticed what ABC News said were "odd behaviors." In November 2009—the same month he first contacted WikiLeaks—he wrote to a gender counselor in the United States, said he felt female, and discussed having surgery. The counselor said it was clear that he was in crisis, partly because of his gender confusion, but also because he was opposed to the kind of war that he now found himself involved in. On May 7, 2010, he reportedly punched a woman officer in the face, and was demoted from Specialist to Private First Class. He was also told he would be discharged from the army. Julian Assange and Daniel Domscheit-Berg at the Chaos Communication Congress, Berlin, December 2009. It was Assange who had the idea in 2006 of creating an open-source, democratic intelligence agency. WikiLeaks was set up in late 2006 as a disclosure portal, initially using the Wikipedia model, where volunteers would write up and analyze classified or restricted material submitted by whistleblowers, or material that was in some other way legally threatened. It was Julian Assange—an Australian with a background in computer hacking, and the de facto editor-in-chief of WikiLeaks—who had the idea of creating what he saw as an "open-source, democratic intelligence agency." The wiki element was abandoned, but the site remained open for the anonymous submission of leaked documents, using OpenSSL, FreeNet, PGP, and Tor. The New York Times wrote in December 2010 that the U.S. government was trying to discover whether Assange had been a passive recipient of material from Manning, or had encouraged or helped him to extract the files; if the latter, Assange could be charged with conspiracy. According to Daniel Domscheit-Berg, a former WikiLeaks spokesman, part of the WikiLeaks security concept was that they did not know who their sources were. WikiLeaks did not identify Manning as the source of the material, and according to NBC in January 2011, the U.S. government could find no evidence of direct contact between Manning and Assange. Manning told Lamo during their online chats in May 2010 that he had developed a relationship with Assange, but knew little about him. Lamo alleged later that Manning also said he had communicated directly with Assange using an encrypted Internet conferencing service, and that Assange had "coached" him. Lamo is the only source of these allegations; he said these statements from Manning were in the unpublished parts of the chat logs, but that the FBI had taken his hard drive so he no longer had access to the logs. Manning said he gave WikiLeaks the "Apache airstrike" video in February 2010. Manning is said to have first contacted WikiLeaks in November 2009, days after it posted 570,000 pager messages from the September 11, 2001, attacks. From his workstation in Iraq, Manning had access to SIPRNet and the Joint Worldwide Intelligence Communications System, and in late 2009 he found the Apache helicopter video. He told Lamo: "At first glance it was just a bunch of guys getting shot up by a helicopter. No big deal ... about two dozen more where that came from, right? But something struck me as odd with the van thing, and also the fact it was being stored in a JAG officer’s directory. So I looked into it." Manning's former partner, Tyler Watkins, told reporters that, while on leave in Boston in January 2010, Manning said he had found some sensitive information and was considering leaking it. During the same month Manning began posting on Facebook in a way that suggested he was upset about something. According to The Daily Telegraph, he wrote, "Bradley Manning didn't want this fight. Too much to lose, too fast," and said he was livid after being "lectured by ex-boyfriend." On February 18, WikiLeaks posted the first of the material that allegedly came from him, a diplomatic cable dated January 13, 2010, from the U.S. Embassy in Reykjavik, Iceland—a document now known as Reykjavik13. In the chat log, Manning called this a "test" document. On March 15, WikiLeaks posted a 32-page report written in 2008 by the U.S. Department of Defense about WikiLeaks itself. On March 29, it posted U.S. State Department profiles of politicians in Iceland. On April 5, it published the Apache helicopter video of the July 2007 Baghdad airstrike, which Manning is alleged to have passed on in February; WikiLeaks called it the "Collateral Murder" video, and it attracted widespread coverage. On July 25, it released the Afghan war documents, and in October the Iraq War documents, internal military war logs and diaries. Manning is also alleged to have given them 251,287 U.S. state department cables—written by 260 embassies and consulates in 180 countries—which were passed by Assange to several news organizations. Several thousand of them were published in stages, the first by WikiLeaks in February 2010 (the Reykjavik13 document), then from November 29 by The New York Times, Der Spiegel, The Guardian, El País, and others. WikiLeaks said it was the largest set of confidential documents ever released into the public domain. On May 7, 2010, after punching a female officer in the face, Manning was demoted and told he was about to be discharged. On May 20, he contacted Adrian Lamo, a former "grey hat" hacker convicted in 2004 of having accessed The New York Times computer network without permission. Lamo had been profiled that day by Kevin Poulsen in Wired magazine after being hospitalized and diagnosed with Asperger's Syndrome. Poulsen, now a reporter, is himself a former hacker who had used Lamo as a source several times over the years. According to Lamo, Manning sent him several encrypted e-mails on May 20 after seeing a tweet from Lamo about WikiLeaks. Lamo said he was unable to decrypt the e-mails but replied anyway, not knowing the recipient or being able to read the content, and invited the e-mailer to chat on AOL IM. Manning sent him more e-mails, also encrypted. Lamo said he later turned these and the earlier e-mails over to the FBI without having read them. In a series of chats from May 21 until May 25/26, Manning—using the handle "Bradass87"—apparently told Lamo that he had leaked classified material. He introduced himself to Lamo as "an army intelligence analyst, deployed to eastern Baghdad, pending discharge for 'adjustment disorder' in lieu of 'gender identity disorder'." Just over 10 minutes later he asked Lamo: "If you had unprecedented access to classified networks 14 hours a day 7 days a week for 8+ months, what would you do? Lamo told him: "I'm a journalist and a minister. You can pick either, and treat this as a confession or an interview (never to be published) & enjoy a modicum of legal protection." Manning told Lamo he felt isolated, and had "lost all of my emotional support channels ... family, boyfriend, trusting colleagues ... im a mess." He said he had started to help Wikileaks around Thanksgiving in November 2009, after Wikileaks had released the 9/11 pager messages. He said he recognized they had come from an NSA database, and told Lamo it made him feel comfortable about stepping forward. He told Lamo that Secretary of State Hillary Rodham Clinton "and several thousand diplomats around the world are going to have a heart attack when they wake up one morning, and finds an entire repository of classified foreign policy is available, in searchable format to the public ... everywhere there's a US post ... there's a diplomatic scandal that will be revealed". Lamo asked what kind of material, and Manning replied: "uhm ... crazy, almost criminal political backdealings ... the non-PR-versions of world events and crises ..."
He said he hoped the material would lead to "worldwide discussion, debates, and reforms," and if not we're "doomed as a species...". He said the reaction to the Baghdad airstrike video had given him hope: "CNN’s iReport was overwhelmed ... Twitter exploded ..." He continued: "i want people to see the truth… regardless of who they are ... because without information, you cannot make informed decisions as a public. Lamo told Wired he had given money to WikiLeaks in the past, and that the decision to go to the authorities had not been an easy one. He said he believed lives were in danger: "[Manning] was in a war zone and basically trying to vacuum up as much classified information as he could, and just throwing it up into the air." Lamo said he had offered journalist-source anonymity to Manning during the chats, but he approached federal agents shortly after their first chat. Jonathan V. Last wrote that Lamo discussed what Manning had told him with Chet Uber of the volunteer group, Project Vigilant, which researches cyber crime, and Uber reportedly told Lamo to go to the FBI. On May 25, Lamo met with FBI and Army CID officers at a Starbucks near his home in California, where he showed them the chat logs. He met them again on May 27, at which point they told him Manning had been arrested in Iraq the day before. The news of his arrest was broken on June 6 by Wired reporter Kevin Poulsen, who had written the May 20 Wired profile of Lamo. Daniel Domscheit-Berg described it as the worst moment in the history of WikiLeaks. Wired published around 25 percent of the chat logs on June 6 and June 10, saying the remainder either infringed Manning's privacy or compromised sensitive military information. Ellen Nakashima of The Washington Post published excerpts on June 10, and on June 19 BoingBoing published what it said was a more complete version. Glenn Greenwald, writing in Salon in December 2010, called the failure to publish the logs in full "easily one of the worst journalistic disgraces of the year," writing that Poulsen and Wired had helped conceal the truth about the arrest. "In doing so," he argued, "they have actively shielded Poulsen's longtime associate, Adrian Lamo—as well as government investigators—from having their claims about Manning's statements scrutinized, and have enabled Lamo to drive much of the reporting of this story by spouting whatever he wants about Manning's statements without any check." Wired's editor, Evan Hansen, wrote that the logs included sensitive personal information that had no bearing on WikiLeaks, and that it would serve no purpose to publish them. Wired eventually published the full logs in July 2011. Template:Manning timeline Manning was arrested on May 26, 2010, and held at first in a military jail at Camp Arifjan in Kuwait. He was charged on July 5 under the Uniform Code of Military Justice (UCMJ) with violations of UCMJ Articles 92 and 134 for "transferring classified data onto his personal computer and adding unauthorized software to a classified computer system in connection with the leaking of a video of a helicopter attack in Iraq in 2007," and "communicating, transmitting and delivering national defense information to an unauthorized source and disclosing classified information concerning the national defense with reason to believe that the information could cause injury to the United States," between November 19, 2009, and May 27, 2010. He was also one of those named in the Twitter subpoena later in December, when the U.S. government tried to obtain access to the Twitter accounts of several of those involved. On March 1, 2011, an additional 22 charges were preferred, including wrongfully obtaining classified material for the purpose of posting it on the Internet, knowing that the information would be accessed by the enemy; the illegal transmission of defense information; fraud; and aiding the enemy. CBS reported that the new charges involved the leaking of the Afghan and Iraq war logs, and a quarter of a million State Department cables; according to ABC News, the charge sheets said Manning had transferred 380,000 records about Iraq, and 90,000 about Afghanistan. In all, CBS said, he is accused of having leaked over half a million documents and two videos. Prosecutors told Manning's lawyers they would not seek the death penalty, though the charge of aiding the enemy is a capital offense. They said if convicted he will face life imprisonment, reduction in rank to the lowest enlisted pay grade, a dishonorable discharge, and loss of pay and allowances. On July 29, 2010, Manning was moved from Kuwait to the Marine Corps Base Quantico, Virginia, and classified as a "maximum custody detainee" held under a "Prevention of Injury" assignment until April 2011. At Quantico he was detained in a 6 x 12 ft cell, with no window, furnished with a bed, toilet and sink, and with meals taken in his cell. According to The Washington Post, the facility had 30 cells built in a U shape, and although the detainees could talk to one another, they were unable to see each other, according to his lawyer, David Coombs, a former military attorney and member of the United States Army Reserve. Coombs said in December 2010 that the guards were professional, and had not tried to bully, harass, or embarrass Manning. He was allowed outside his cell to walk for up to one hour a day, shackled. There was access to television for limited periods when it was placed in the corridor outside his cell. He was allowed to keep one book and one magazine in his cell—according to Leigh and Harding, he requested Immanuel Kant's Critique of Pure Reason (1781)—but otherwise no writing materials, though access to them was given during allotted times. He was shackled during visits. A Prevention of Injury order is one stop short of suicide watch. It entails checks by guards every five minutes, and no sleeping during the day. His lawyer said he was not allowed to sleep between 5 am (7 am at weekends) and 8 pm, and if he tried to, was made to stand or sit up. He was required to remain visible at all times, including at night, which entailed no access to sheets, no pillow except one built into his mattress, and a blanket designed not to be shredded. Until March 2011 he was required to sleep in boxer shorts, and had experienced chafing of the skin from the heavy blanket. On March 2, he was told that an Article 138 complaint filed in January by his lawyer—asking that he be removed from maximum custody and prevention-of-injury watch—had been denied. His lawyer said Manning subsequently joked to the guards that, if he wanted to harm himself, he could do so "with the elastic waistband of his underwear or with his flip-flops." This resulted in him being required to sleep without clothing and present himself naked outside his cell for morning inspection, which his lawyer described as ritual humiliation, though from around March 10 onwards he was given a wrap-around smock with Velcro fasteners to sleep in. In response to the incident, the brig psychiatrist classified him as at low risk of suicide. Manning's lawyer released an 11-page letter from Manning on March 10, 2011, written to the U.S. military in response to their decision to retain his Prevention of Injury status. In the letter, he described having been placed on suicide watch for three days in January, and having had his clothing removed, apart from underwear, as well as prescription eyeglasses; he said the loss of the latter forced him to sit in "essential blindness." He wrote that he believed this was done as retribution for a protest his supporters had held outside the jail the day before; he alleged that, just before the suicide watch began, the guards began harassing him and issuing conflicting orders, telling him to turn left, then not to turn left. He also described being required to sleep without clothes and stand naked for morning parade: "The guard told me to stand at parade rest, with my hands behind my back and my legs spaced shoulder width apart. I stood at "parade rest" for about three minutes until the DBS [duty brig supervisor] arrived. ... The DBS looked at me, paused for a moment, and then continued to the next detainee's cell. I was incredibly embarrassed at having all these people stare at me naked. ..." He wrote that the smock he was later given to wear at night was coarse and uncomfortable, and that he regarded the removal of his other clothing as unlawful pretrial punishment. The conditions of his detention prompted international concern. David House, the computer scientist allowed to visit him twice a month, said in December 2010 that he had watched Manning change from an intelligent young man to someone who appeared catatonic and had difficulty conducting a conversation. Democratic Rep. Dennis Kucinich and Pentagon Papers whistleblower Daniel Ellsberg, a WikiLeaks volunteer, compared the treatment to what happened inside the Abu Ghraib prison in Iraq. Ellsberg wrote that it amounted to "no-touch torture", and that its purpose was to demoralize Manning so he would implicate Wikileaks and Julian Assange. A Quantico spokesman said in January 2011 that allegations of mistreatment were "poppycock," and that Manning had been designated "maximum custody" because his escape would pose a national security risk. The spokesman said Manning could talk to guards and prisoners in other cells, though he could not see the prisoners, and left his cell for a daily hour of exercise, and for showers, phone calls, meetings with his lawyer, and weekend visits by friends and relatives. Pentagon spokesman Geoff Morrell and Pentagon General Counsel Jeh Johnson visited Quantico in February 2011 to examine the conditions of the detention. Morrell said he was impressed by the professionalism of the staff, and that Manning's housing and treatment were appropriate. He said: "It just so happens that the configuration of the brig is that every individual is confined to his or her own cell. He's being provided well-balanced, nutritious meals three times a day. He receives visitors and mail, and can write letters. He routinely meets with doctors, as well as his attorney. He's allowed to make telephone calls. And he is being treated just like every other detainee in the brig." Juan E. Mendez, a United Nations Special Rapporteur on torture, submitted an inquiry about Manning to the U.S. State Department around January 2011, and in April accused the government of prevarication in response to his request for an unmonitored meeting with Manning, saying he was deeply disappointed and frustrated. Amnesty International issued a complaint to the U.S. Secretary of Defense, and asked the British government to intervene on the grounds that Manning is a British citizen by descent through his Welsh mother. The British Embassy in Washington expressed concern to the State Department in March; Manning's case was raised in the British parliament by Labour MP Ann Clwyd, who is Welsh; and in April Manning's mother asked that British consular officials visit him in prison. Manning himself has not asked for assistance from the British government, and his lawyer has said Manning does not regard himself as a British citizen. In March, State Department spokesman Philip J. Crowley, speaking to a small audience, called Manning's treatment "ridiculous and counterproductive and stupid"; he resigned two days later, reportedly under pressure from the White House. His remark, described as a personal opinion, prompted reporters to ask President Obama to comment on Manning's detention at a news conference; he replied: "... I have actually asked the Pentagon whether or not the procedures that have been taken in terms of his confinement are appropriate and are meeting our basic standards. They assured me that they are. I can't go into details about some of their concerns, but some of this has to do with Private Manning's safety as well." He added later that Manning had broken the law. In April, 295 scholars signed a letter published in the New York Review of Books objecting to the conditions of Manning's detention. Signatories included Yochai Benkler and Laurence Tribe of Harvard Law School and Bruce Ackerman of Yale Law School. The letter said the conditions of the detention were a violation of the U.S. Constitution, specifically the Eighth Amendment's prohibition of cruel and unusual punishment, and the Fifth Amendment's guarantee against punishment without trial, and that if the conditions continued they might amount to a violation of the criminal statute against torture: "procedures calculated to disrupt profoundly the senses or the personality." The Pentagon transferred Manning on April 20, 2011, to the Midwest Joint Regional Correctional Facility, a new medium-security facility in Fort Leavenworth, Kansas. The prevention-of-injury order was lifted, his clothes were not removed at night, and he was placed in a cell with a large window with natural light and a normal mattress. He was able to mix with other pre-trial detainees, write whenever he wanted, and keep personal objects, such as books and letters, in his cell. The Bradley Manning Support Network was formed in June 2010 by Mike Gogulski, an American living in Slovakia. Manning's friend, David House, was also involved in founding it, and it was coordinated by Courage to Resist, which supports war resisters within the military. Several notable figures joined its advisory board, including Daniel Ellsberg, one of 30 protesters arrested outside the Quantico base in March 2011; filmmaker Michael Moore, who contributed $5,000; Ray McGovern, a former CIA analyst; and Ann Wright, a retired army colonel. Rallies were held in the United States, Canada, the Netherlands, and Ireland, and by January 2011 donations for Manning's defense had risen to over $100,000, including $15,100 from WikiLeaks. The hacker group Anonymous threatened in March 2011 to disrupt activities at Quantico by cyber-attacking communications and exposing information about personnel, calling it "Operation Bradical." Wikimedia Commons has media related to Chelsea Manning. ^ a b c d e Nicks, Denver. "Private Manning and the Making of Wikileaks", This Land, September 23, 2010. For the charges against Manning, see "Soldier faces criminal charges", United States Division—Center, Media Release, July 6, 2010, accessed February 19, 2011; for the additional charges, see Miklaszewski, Jim and Kube, Courtney. "Manning faces new charges, possible death penalty", msnbc.com, March 2, 2011. That he was found fit to stand trial, see "Panel Says WikiLeaks Suspect Is Competent to Stand Trial", Associated Press, April 29, 2011. ^ a b c d Poulsen, Kevin and Zetter, Kim. "U.S. Intelligence Analyst Arrested in Wikileaks Video Probe", Wired magazine, June 6, 2010. Also see "Charge sheet", Cryptome, accessed December 26, 2010. ^ a b "WikiLeaks Suspect Transferred to Fort Leavenworth", Associated Press, April 20, 2011. ^ Fishman, Steve. "Bradley Manning’s Army of One", New York, July 3, 2011, p. 2ff. ^ Leigh, David and Harding, Luke. Wikileaks: Inside Julian Assange's War on Secrecy. Guardian Books, 2011, pp. 20–24. Also see Nicks, Denver. "Private Manning and the Making of Wikileaks", This Land, September 23, 2010. For his weight and height, see Kirkland, Michael. "Under the U.S. Supreme Court: Bradley Manning, WikiLeaks martyr? ", UPI, March 13, 2011. ^ For his mother not adjusting, and Manning fending for himself, see Thompson, Ginger. "Early Struggles of Soldier Charged in Leak Case", The New York Times, August 8, 2010. For having an attitude, and being a "computer nerd", see Booth, Robert; Brooke, Heather; and Morris, Steve. "WikiLeaks cables: Bradley Manning faces 52 years in jail", The Guardian, November 30, 2010. For being the only American in the school, building his own website, and for being impersonated, see Leigh and Harding 2011, p. 24. For Tom Dyer's comments, see "Wikileaks: Bradley Manning 'set up own Facebook'", Channel 4 News, December 1, 2010. ^ a b Leigh and Harding 2011, pp. 25–26. Leigh and Harding 2011, p. 72. ^ Fishman, July 3, 2011, p. 1. ^ Moran, Terry. "Should PFC Bradley Manning Spend The Rest Of His Life In Prison? ", Nightline, ABC News, November 29, 2010, courtesy of YouTube, accessed February 19, 2011. ^ a b O'Kane, Maggie; Madlena, Chavala; Grandjean, Guy; and Fisher, Daniel. "WikiLeaks accused Bradley Manning 'should never have been sent to Iraq'", The Guardian, May 27, 2011; for the allegation about the woman officer and his discharge, see the Guardian's video, 17:40 mins. Also see O'Kane, Maggie; Madlena, Chavala; Grandjean, Guy; and Fisher, Daniel. "Bradley Manning: the bullied outsider who knew US military's inner secrets", The Guardian, May 27, 2011. ^ For the U.S. government trying to determine whether Assange encouraged Manning, and that the government took Lamo's hard drive, see Savage, Charlie. "U.S. Tries to Build Case for Conspiracy by WikiLeaks", The New York Times, December 15, 2010. For Domscheit-Berg, see Domscheit-Berg, Daniel. Inside WikiLeaks. Doubleday, 2011, p. 165. For Manning's comments to Lamo; for Lamo's allegations about Manning's contact with Assange and his use of an Internet conferencing service; and that Lamo is the only source of the allegations, see Leigh and Harding 2011, p. 75. That the U.S. government can find no direct connection between Manning and Assange, see Miklaszewski, Jim. "NBC: U.S. can't link accused Army private to Assange", NBC News, January 24, 2011. Also see Barnes, Julian and Perez, Evan. "Assange Probe Hits Snag", Wall Street Journal, February 9, 2011. ^ Leigh and Harding, 2011, p. 31. ^ Blake, Heidi; Bingham, John; and Rayner, Gordon. "Bradley Manning, suspected source of Wikileaks documents, raged on his Facebook page", The Daily Telegraph, July 30, 2010. ^ For the publishing sequence, see Leigh and Harding 2010, p. 70. For more information about the "Reykjavik 13" cable and the State Department profiles of politicians, see Myers, Steven Lee. "Charges for Soldier Accused of Leak", The New York Times, July 6, 2010. For the leak of the Defense Dept report on WikiLeaks, see Kravets, David. "Secret Document Calls Wikileaks ‘Threat’ to U.S. Army", Wired, March 15, 2010. For the Defense Dept report itself , see Assange, Julian. "U.S. intelligence planned to destroy WikiLeaks", WikiLeaks release on March 15, 2010 of Horvath, Michael D. "Wikileaks.org—An Online Reference to Foreign Intelligence Services, Insurgents, or Terrorist Groups? ", United States Army Counterintelligence Center, Department of Defense Counterintelligence Analysis Program, March 18, 2008. ^ Leigh and Harding, 2010, pp. 70, 194ff, 211. See p. 70 for the date of the Apache video; p. 194ff for the other material WikiLeaks published; and p. 211 for the number of documents and the quote from WikiLeaks. As of February 2011, the contents of 4,000 cables had been published. The Guardian published identifying information for all the cables (date, sender, etc.) on its website on December 3, 2010. See Fowler, Andrew. The Most Dangerous Man in the World. Skyhorse Publishing, 2011, pp. 207–208. ^ Poulsen, Kevin. "Ex-Hacker Adrian Lamo Institutionalized for Asperger’s", Wired, May 20, 2010. For information about Poulsen's relationship with Lamo, see Last, Jonathan V. "The Left's Canonization of St. Bradley Manning", CBS News, January 11, 2011. For Lamo's conviction, see Shachtman, Noah, "Adrian Lamo Cuts Deal With Feds", Wired, January 9, 2004. ^ a b Greenwald, Glenn. "The strange and consequential case of Bradley Manning, Adrian Lamo and WikiLeaks", Salon, June 18, 2010. "Lamo, however, told me that Manning found him not from the Wired article—which Manning never mentioned reading—but from searching the word "WikiLeaks" on Twitter, which led him to a tweet Lamo had written that included the word "WikiLeaks." Even if Manning had really found Lamo through a Twitter search for "WikiLeaks," Lamo could not explain why Manning focused on him, rather than the thousands of other people who have also mentioned the word "WikiLeaks" on Twitter, including countless people who have done so by expressing support for WikiLeaks." ^ Leigh and Harding 2011, p. 76. ^ a b c d e f g h i Hansen, Evan. Manning-Lamo Chat Logs Revealed, Wired magazine, July 13, 2011. ^ Domscheit-Berg 2011, p. 164. ^ a b Greenwald, Glenn. "The worsening journalistic disgrace at Wired", Salon, December 27, 2010. Also see Greenwald, Glenn. "Wired's refusal to release or comment on the Manning chat logs", Salon, December 30, 2010. ^ Hansen, Evan and Poulsen, Kevin. "Putting the Record Straight on the Lamo-Manning Chat Logs", December 28, 2010. ^ Poulsen, Kevin and Zetter, Kim. "Three Weeks After Arrest, Still No Charges In Wikileaks Probe", Wired magazine, June 16, 2010. ^ "Attorney for WikiLeaks suspect says he's seen no evidence on documents", CNN, August 31, 2010. Also see "Charge sheet", courtesy of Cryptome, accessed December 26, 2010. ^ "Twitter Subpoena", Salon, January 10, 2011. ^ Miklaszewski, Jim and Kube, Courtney. "Manning faces new charges, possible death penalty", msnbc.com, March 2, 2011. For the CBS report on the number of documents involved, and the penalty if convicted, see "WikiLeaks: Bradley Manning faces 22 new charges", CBS News, March 2, 2011. For the ABC figures, see Martinez, Luis. "22 New Charges Against Pvt. Bradley Manning, Accused WikiLeaks Source", ABC News, March 2, 2011. For Manning's lawyer's description of the detention, see "A Typical Day for PFC Bradley Manning", The Law Offices of David E. Coombs, December 18, 2010, accessed March 7, 2011. For Manning's request of Kant's Critique of Pure Reason, see Leigh and Harding, 2011, p. 89. ^ For details of the new rule, and the brig psychiatrist's classification, see Nakashima, Ellen. "In brig, WikiLeaks suspect Bradley Manning ordered to sleep without clothing", The Washington Post, March 5, 2011. For his lawyer calling it ritual humiliation, see Gallagher, Roy. "Bradley Manning and the stench of US hypocrisy", The Guardian, March 4, 2011. For a sleep garment having been supplied, see Nakashima, Ellen. /11/AR2011031106542.html "WikiLeaks suspect's treatment 'stupid,' U.S. official says", The Washington Post, March 12, 2011. For a description of the smock, see "Editorial; The Abuse of Private Manning", The New York Times, March 15, 2011. ^ Pilkington, Ed. "Stripped naked every night, Bradley Manning tells of prison ordeal", The Guardian, March 11, 2011. For Manning's letter, see "Memorandum", released by David Coombs, March 10, 2011, accessed March 12, 2011. See pp. 7, 9 for his having had his eyeglasses removed; p. 7 for the alleged harassment and conflicting orders; p. 10 for his embarrassment about his lack of clothing. ^ For David House's view, see Brooke, Heather. "Bradley Manning's health deteriorating in jail, supporters say", The Guardian, December 16, 2010. For more on House's views, see Sontheimer, Michael. "I Have Watched My Friend Degrade over Time", Der Spiegel, March 14, 2011. For Dennis Kuninich, see "State Department spokesperson P.J. Crowley decries Bradley Manning's treatment as 'counterproductive,' 'stupid'", CBS News, March 11, 2011. For Daniel Ellsberg, see Ellsberg, Daniel. "This shameful abuse of Bradley Manning", The Guardian, March 11, 2011. For more information, see Greenwald, Glenn. "The inhumane conditions of Bradley Manning's detention", Salon, December 15, 2010. ^ For the Quantico spokesman's description of detention, see Shane, Scott. "Accused Soldier in Brig as WikiLeaks Link is Sought", The New York Times, January 13, 2011. For Geoff Morrell's opinion and Jeh Johnson's visit, see Nakashima, Ellen. "In brig, WikiLeaks suspect Bradley Manning ordered to sleep without clothing", The Washington Post, March 5, 2011, p. 2. For more on Johnson's visit, see Horton, Scott. "Inhumanity at Quantico", Harper's Magazine, March 7, 2011. For Morrell's opinion that he is being treated like other detainees, see Tapper, Jake and Radia, Kirit. "Comments on Prisoner Treatment Cause State Department Spokesman to Lose His Job", ABC News, March 13, 2011. ^ MacAskill, Ewen. "Bradley Manning case sparks UN criticism of US government", The Guardian, 11 April 2011. Also see Shane, Scott. "Accused Soldier in Brig as WikiLeaks Link is Sought", The New York Times, January 13, 2011. ^ For the Amnesty complaint, see "Letter from Amnesty International to Robert M. Gates", Amnesty International, London, January 19, 2011, courtesy of Allvoices.com, accessed February 15, 2011. For Amnesty's approach to the British government, see Pilkington, Ed; McGreal, Chris; and Morris, Steven. "Bradley Manning is UK citizen and needs protection, government told", The Guardian, February 1, 2011. The newspaper wrote that under the British Nationality Act 1981 anyone born outside the UK after 1 January 1983 whose mother is a British citizen by birth is British by descent. For the British embassy and Ann Clywd, see Addley, Esther and Leigh, David. "Bradley Manning supporters welcome UK government's expression of concern", The Guardian, April 5, 2011; for Ann Clywd raising the issue in the House of Commons, see "MPs raise concerns over Bradley Manning's treatment", BBC, April 4, 2011. For Manning's mother, see "Bradley Manning needs consular visit, mother tells William Hague", The Guardian, 13 April 2011. ^ Coombs, David E. "Clarification Regarding PFC Manning's Citizenship", Law Offices of David E. Coombs, February 2, 2011: "There has been some discussion regarding PFC Bradley Manning's citizenship. PFC Manning does not hold a British passport, nor does he consider himself a British citizen. He is an American, and is proud to be serving in the United States Army. His current confinement conditions are troubling to many both here in the United States and abroad. This concern, however, is not a citizenship issue." ^ For Philip J. Crowley's and President Obama's comments, see Nakashima, Ellen. "WikiLeaks suspect's treatment 'stupid,' U.S. official says", The Washington Post, March 12, 2011. For more of Obama's reply, see Zengerle, Patricia. "Obama asked Pentagon about Wiki soldier's treatment", Reuters, March 11, 2011. For Crowley's resignation, see Tapper, Jake and Radia, Kirit. "Comments on Prisoner Treatment Cause State Department Spokesman to Lose His Job", ABC News, March 13, 2011. ^ Lee, M.J. and Phillip, Abby. "Barack Obama on Bradley Manning: 'He broke the law'", Politico, April 22, 2011. ^ Ackerman, Bruce and Benkler, Yochai. "Private Manning’s Humiliation", The New York Review of Books, accessed April 10, 2011. For the list of signatories, see "A Statement on Private Manning's Detention", balkin.blogspot.com, March 15, 2011, accessed April 10, 2011. For analysis, see Pilkington, Ed. "Bradley Manning: top US legal scholars voice outrage at 'torture'", The Guardian, April 10, 2011. ^ For the Support Network's founder, Mike Gogulksi, and Michael Moore, see Dishneau, David. "Michael Moore Praises Suspected WikiLeaks Source", Associated Press, August 21, 2010. For more about Gogulski and the Courage to Resist, see Savage, Michael W. "Army analyst linked to WikiLeaks hailed as antiwar hero", The Washington Post, August 14, 2010. For David House's involvement, see Greenwald, Glenn. "Government harassing and intimidating Bradley Manning supporters", Salon, November 9, 2010. For Daniel Ellsberg joining, see "Support for US 'WikiLeaks' soldier raised in west Wales", BBC News, September 16, 2010. For Ann Wright and Ray McGovern, see McGreal, Chris. "Michael Moore campaigns to free Bradley Manning in war logs case", The Guardian, September 15, 2010. For the rallies, see "Montreal protesters rally in support of WikiLeaks", The Montreal Gazette, December 18, 2010. For the donations, see "WikiLeaks contributes to Manning defense, support group says", CNN, January 15, 2011. For the support group's advisory board, see "Advisory Board", Bradley Manning Support Network, accessed March 4, 2011. For Ellsberg's arrest, see Fears, Darryl. "Protesters arrested near Quantico as rally for alleged WikiLeaks source turns tense", The Washington Post, March 20, 2011. ^ Greenberg, Andy. "Anonymous Hackers Target Alleged WikiLeaker Bradley Manning’s Jailers", Forbes, March 7, 2011. For "Operation Bradical," see Emspak, Jesse. "Anonymous Threatens To Post Info On Bradley Manning's Guards", International Business Times, March 10, 2011. Poulsen, Kevin. "Ex-Hacker Adrian Lamo Institutionalized for Asperger’s", Wired magazine, May 20, 2010. Xeni, Jardin. "Wikileaks: a somewhat less redacted version of the Lamo/Manning logs", Boing Boing, June 19, 2010. Hansen, Evan and Poulsen, Kevin. "Putting the Record Straight on the Lamo-Manning Chat Logs", Wired, December 28, 2010. Firedoglake. "Manning/Wikileaks timeline", published as a complete version of the released excerpts, accessed March 14, 2011. Hansen, Evan. "Manning-Lamo Chat Logs Revealed", Wired, July 13, 2011. Democracy Now! "Glenn Greenwald on the Assange Extradition Ruling, the Jailing of Bradley Manning ...", February 24, 2011.